Over the past 40 years, Germany has maintained a leading position in environmental incentives and benefit programs. The incentives have ranged from PV systems (photo-voltaic), to insulation and windows. What have they done? Is there anything the United States environmental policy makers could learn from Germany’s forward thinking? The policies encompass many different categories, but the three main areas are energy, urban infrastructure, and transportation. The country’s policymakers started out small, thinking of little changes that could be made to spur forward action. About a year ago, president Obama stated that he wished for eighty percent of electricity to come from clean sources. This goal, of course, was not reached. Germany knew that setting a goal and failing would deter people from believing in the system. Llittle steps can keep the public interested. The green plan adopted in 2010 is the Energy Concept. This states that primary energy consumption will fall by 20% by 2020 and 50% by 2050. With the help of nuclear power and the spike in gas prices (over $7US/Gallon), energy consumption and greenhouse gas pollution has decreased significantly in Germany. The incentive with the gas, however, is more or less a little push to get people to use bicycles, public transportation, or carpool. All of these alternatives are valid in the United States as well; however, we do not see spiking gas prices as good for the environment, but instead, bad for the economy. “Not living at the expense of people in other regions of the earth or at the expense of future generations living here and today.” Germany defined sustainability in a way to look not at the individual, but at the future and the surroundings. The changes made today will not directly affect the people who make them, but instead, their children, and their grandchildren. Forward thinking is another concept Germany has followed. The incentives for sustainable design and renewable energy originally focused only on solar power. PV panels to generate energy has been viewed as a tax deduction in Germany for many years. With this known, it is not surprising that Germany made up 50% of the solar power worldwide market, with larger countries such as the US and China falling short. Germany has become a powerhouse for energy efficiency. These incentives, however, have seen many cutbacks in the past 3 years, while the United States has seen large increases. These cuts in subsidies are due in part to the soaring number of purchases, yet even as the cuts increase, so do the number of solar panels. But Germany is still viewed as a green leader. So what does this say about the incentives and their effectiveness? Germany witnessed years of decreased emissions and energy use, giving other countries the push needed to follow step. Since then , the US government has begun offering tax credits to homeowners and business owners for solar panel additions, as well as paying for those consumers who give back to the grid (producing more energy than they consume). One of the great benefits of living in South Florida is the ability to be outside pretty much year round. With the exception of some heavy rain-days, our climate is ideal to be outside. There are numerous options to add living space to the exterior without much effort. Going back to some of the earlier settlers that helped define some of the appropriate building features, we see large overhangs and nice elevated porches. The fireplace, serving as the cooking area, is pushed to the outside or located, under cover, outside completely. A great space to take the concept of outdoor living to the next level is the kitchen. From a simple BBQ area to a full fledged kitchen, with all the appliances its indoor companion would have. Let’s start with the simple features. 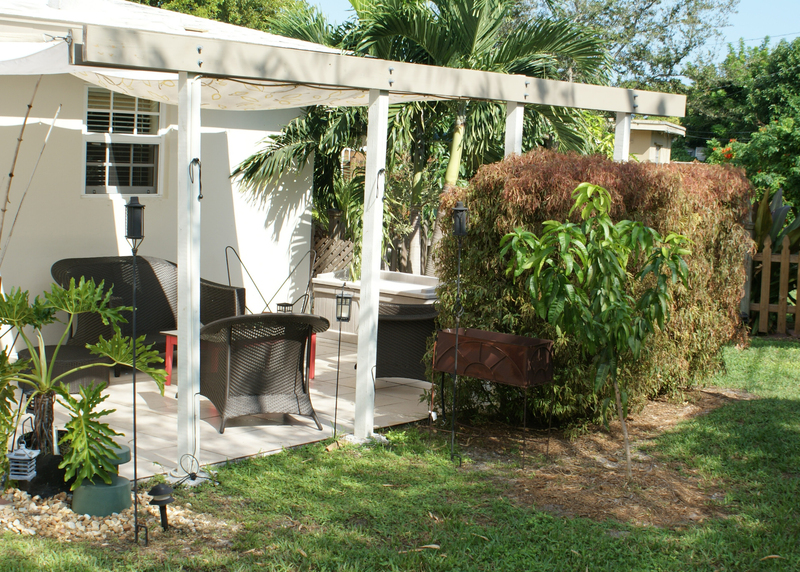 Pretty any outdoor kitchen will have, and is likely to be centered around, a BBQ. It makes perfect sense to have the BBQ outside, a favorite summer activity for northern climates and a year round treat for our southern climate to enjoy. Having this heat creating monster outside has another benefit in our backyard: no need to cool down the hot air created from cooking or open flame grilling! The next best feature for the outdoor kitchen is a sink, preferable with some counter space adjacent to it to wash off prepped food for the BBQ and other items. Since we have created a counter, the next step is under counter storage. Waterproofing is key and the type of storage will be different from items stored inside, especially perishable goods. After storage we can focus on cooling: refrigeration. Besides minimizing the distance to grab a cold beer, and in the process letting out valuable cooled air by opening your sliding or French doors, the proximity offers many benefits, especially when entertaining. Of course, when selecting items like cook top/BBQ and refrigerator, look for Energy Star or gas options. For the faucet, get a low Flow WaterSense label type and consider draining into a collecting barrel or rain garden. With limited use, it is easy to control what will go down the drain in the outdoor sink! Dishwasher, Microwave and Toaster/small appliances. Leave them inside and only bring them out for events. The dishwasher required proper drainage and this is an item that you also want to leave inside, to make your outdoor kitchen a reasonable project to complete. Even slightly moist areas will create mold and small appliances tend to rust quickly due to our high humidity. No need for mold and rust in your great new outdoor kitchen. 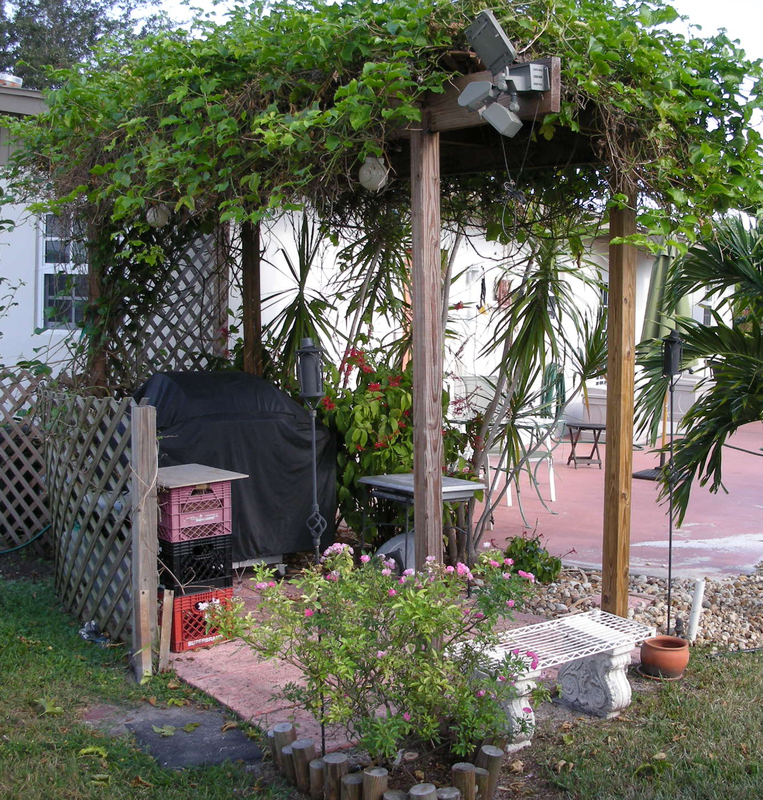 …remember the best of South Florida: year round vegetation! This means that you can grow your own herbs and even some veggies year round, and it also means that composting is an easy must…integrate it into the layout and have designated spaces close by. Your neighbors/guests just might pick up on the idea after seeing how easy it is.